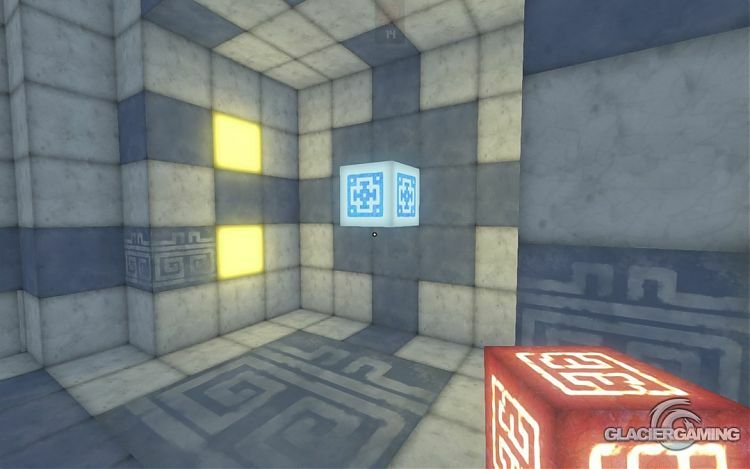 QBEH-1: The Atlas Cube is the prequel to the popular indie title QBEH, and is a first person puzzle platformer, with beautiful level design and wonderful music. When I first loaded up QBEH-1: The Atlas Cube, I had no idea what I was doing. There was no tutorial level, and no pop-ups telling me where to go, or what to do. So I did what any gamer does in this situation: I went exploring! I could see yellow cubes embedded in the walls, so instinctively, I attempted to remove them with the left and right mouse clicks, to no avail. In my wandering, I stumbled upon a red cube, just sat there, on its own. Yoink! After removing it from its position, the world didn’t crumble, nothing tried to eat me, no dark wizards appeared telling of an ancient curse, so I assumed that this was what I was looking for, and I found I could now attach this cube to the yellow ones on the walls, brilliant! I now had a means to ascend the walls and find my way to the next level! Left click to place a cube, and right click to pick up a cube. So simple, and yet so powerful. Even though I had never played this game before, I instantly knew what I needed to do. I do not play a lot of PC games with a keyboard and mouse, I usually opt for a gamepad, but I found the controls are nice and simple, and they feel natural, there are no unnecessary twister style button combinations to press, unlike some PC titles. (Though, I do believe there is an option for a gamepad input). In short, this is what QBEH-1 is all about, you find cubes, you place cubes, you solve the puzzles at hand. Such a simple premise for a game, but Liquid Flower have executed it in such a way, that it does not get old, and by adding a verity of cubes in later levels, it certainly shakes up the mix a little. Your standard cube is a red Structure cube, but you can also get a blue Energy cube, used to activate doors and moving platforms, a purple Gravity cube, used to alter the gravity around an area, and a green Force cube, which you can use as a personal, replaceable, moving platform. Finding new cubes is like Christmas, I genuinely got excited when I had a new cube to try out, and never leave a cube behind, you never know when you’ll need that one extra. There are no enemies in the world, unless you count falling to the abyss, or being crushed by a door, enemies (Yes, I got crushed by a door, no matter how fast you think you are, that door is always faster). Because of this, there is no need to rush through the levels, this allows you to drink in the beauty of the game and appreciate the hard work that has gone into the level design, and the ambient music int he backgrounds. The cel-shaded style, similar to that used in the Borderland series works very well, with an added ancient Greek temple-like feel to the level designs, as does the glowing effect of the cubes in comparison to the main level design. The first world was very bright, sunny and warm, but the second was a very dark world, with a colder feel, the addition to the wind blowing through the empty halls actually made me shiver slightly. But the darker hue gives the glowing cubes an even greater presence. Both styles opposites of one another, but still, amazing to look at. I often found that if I were trying to rush, I would often miss something, something simple, but something important to progress through the levels. I felt that the levels were both simple, and complex at the same time, they’re not overly simple so that completing them feels boring, or a chore, but they’re not overly difficult so that you lose interest. QBEH-1 has struck the equilibrium between challenging, and rewarding, I didn’t feel like I was getting lost, the level design just seemed to flow naturally, leading me to my destination. Most of the time, I found myself simply enjoying the calming effect of the surroundings whilst playing through the levels. Though, as you progress through the levels of a world, you collect more and more cubes, allowing for more complex, and larger puzzles, but going back to an opening level made me feel naked without my large collection of cubes. There are many mechanics that help give the game it’s own unique charm, I mentioned earlier the use of the different cubes, but even the standard Structure cubes have their own uses, you need these to scale the walls, and they can only be attached to special yellow patches, much like the portals from Valve’s Portal series, but they can also be used to stop the movement of certain moving platforms, adding more of an edge to the puzzles, and making you think, and not just placing cubes everywhere you see a yellow patch. 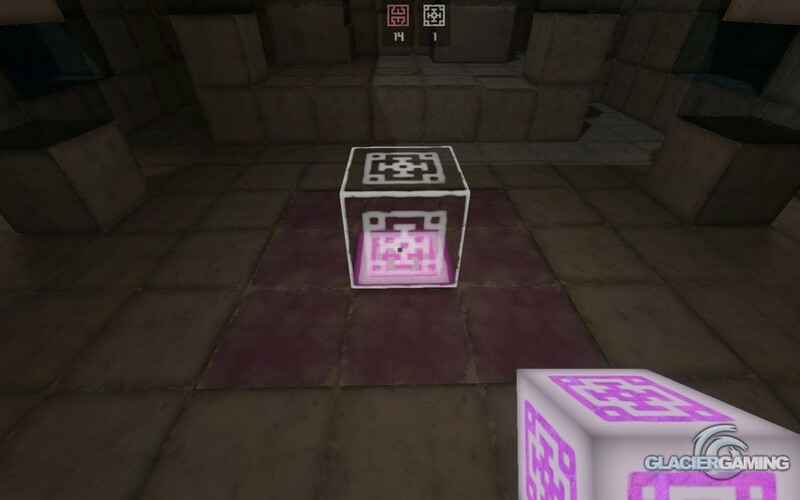 Naturally, a game about cubes is bound to have some reference to a certain other game series, and QBEH-1 rewards those who explore, with a little easter egg. Overall, QBEH-1: The Atlas Cube is a charming puzzle game, which allows the player to absorb themselves in the beautifully crafted world, and simply play the game to relax, without the added stress of being perused, or timed. I easily whiled away a good few hours playing, and only stopped because the real world was calling me, but needless to say, I will be revisiting at every given opportunity, especially with planned Oculus Rift support and a level editor, who can resist?! A simple idea has been taken and turned into a complex puzzle game, with stunning visuals and relaxing music. If you've not played this great indie title yet, I highly suggest you give it a go! This review is based on playing the PC version of QBEH-1: The Atlas Cube that was kindly provided for review purposes by Digital Tribe.